Heidi Schwegler’s exhibition in Disjecta’s Portland2016 Biennial is difficult. You cannot pop in for a moment and expect to take much with you. It requires time to investigate and to understand. But you will be rewarded for your efforts because the more you look, the more you see. The show doesn’t start when you enter the makeshift gallery, which is housed in the abandoned Hazen Hardware store in Clatskanie. The surrounding area informs the exhibition as much as the work itself, so everything you notice from the moment you turn down the sleepy side street in downtown Clatskanie affects the experience. The restaurant on the corner, with a row of hanging flower baskets out front, boasts a gift shop and video lottery. A sign outside the biker-friendly pub & grill advertises Taco Tuesdays. A defunct Oddfellows lodge across the intersection still bears the I.O.O.F. letters above the door even though it is now home to a craft store. Until it closed in 2014, Hazen Hardware had been in business for 56 years, so it has seen the grand openings and not-so-grand closings in Clatskanie, tracking both the rise and fall of the economy and the variability in what we buy and, therefore, value. It contains the cellular memory of place. Walk in to Hazen and you will find yourself face-to-face with a gray powder-coated, chain-link cage, about 8-feet square and open at the top. The closed door to the cage lines up with the open door to the store, so you can only take a few steps before captivity confronts you. It’s not immediately clear if the chain-link fencing is one of Schwegler’s pieces or something left in the retail space by the previous owners. Actually, that’s the case with many of the pieces in the show. In Schwegler’s world, the veil between art and life is thin. Searching for something the brain can definitively identify as art, the eye locks onto five plywood pedestals along the left side of the space, each displaying a single object. Art! 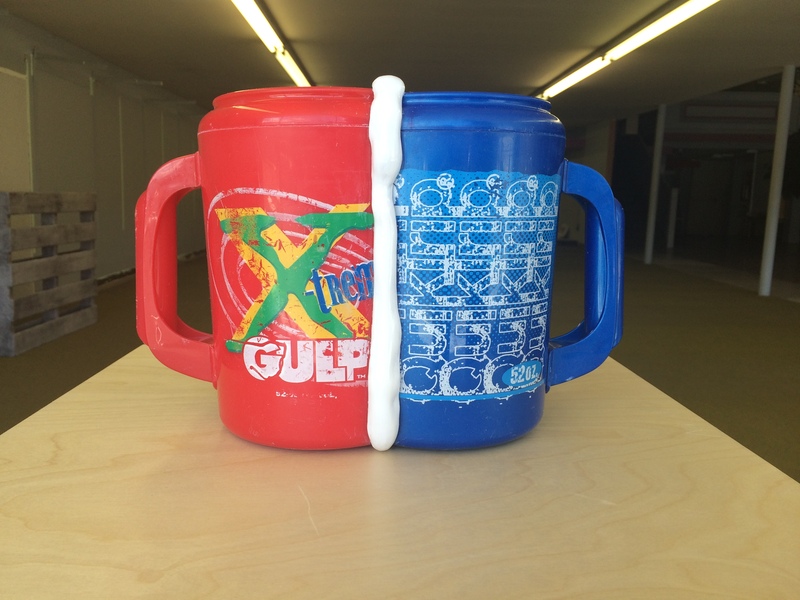 I am drawn to the nearest sculpture, which is made of two plastic gas station mugs—a red Xtreme Gulp™ and a blue QuikTrip®—each cut in half and joined in the middle by an intentionally sloppy vertical line of white epoxy. It is arresting and immediate, the perfect flag for our declining culture: a cheap red, white, and blue trough from which we can drink with both hands. Moving along to the other pedestals, I notice an overturned garbage bin atop one, and a beach ball atop another, and I flirt with the idea of walking out. I am a die-hard populist when it comes to art, so my eye roll reflex is strong. At first glance, Schwegler’s decontextualized objects make me think it’s going to be another one of those Art shows. Wanting to be proven wrong, I go to Schwegler’s artist statement for clues. “As an urban archaeologist,” she writes, “I prefer to mine the peripheral ruin, the discarded stuff that is ignored and considered worthless. By reassigning the value and purpose of something recognizable, I emphasize the perforation between what it was and what it has now become.” I decide to take off my arts writer cap and to simply walk around the space so that I can listen to the stories it wants to tell me, without my own analysis getting in the way.. I have seen two pieces of Schwegler’s work before. The first is a doll-sized self-portrait of the artist, perhaps two-feet tall. The only life-sized features are the head and hands, which were livecast from Schwegler’s body. The dissonance in scale is profoundly disturbing, but the attention to detail—the wrinkles on the figure’s knuckles, the freckles on her face, the individually placed strands of hair and eyelashes, the teeth cast from Schwegler’s own—shows us the level of craftsmanship that Schwegler demands of her work. The second piece is a video that involves a mirror image of a wolf with no head and two bodies, struggling with itself. The slow motion loop captures beauty, grace, and ferocity, and I have sat in front of it more than twice, in the back room at Upfor Gallery, not being able to leave. It helps to understand the type of craftsmanship and beauty that Schwegler brings to her other work, as I make a lap around the hardware store. Rectangular islands of wrinkled pea-green carpeting punctuate a sea of flecked pinkish linoleum, tiles gouged and missing from decades of footfalls. 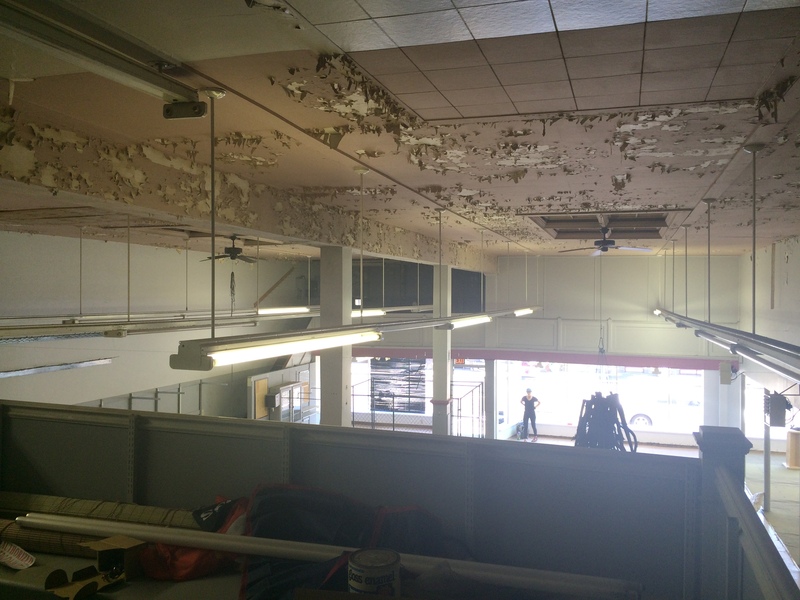 The ceiling is dropped and smooth in certain places—a hint of renovation, an attempt at resurrection—but everywhere else its mauve paint peels violently, as though a great flood once submerged the whole building. Black Venetian blinds, sagging and broken in the front window, look like they have come through a similar disaster. A gallery attendant mentions that the blinds—which are so intrinsic to the space as to be ignorable—have, in fact, been installed by Schwegler. I examine them closely and notice the sun pouring through a constellation of shotgun pellet holes. This is the pivot point for me, the moment when all the work clicks into place. Schwegler is interested in objects that had a useful past and now have an uncertain future, forcing us to reckon with them during an in-between time, “a sort of living death,” as she describes it. I return to the objects on the pedestals with a greater understanding. The beach ball is dirty, likely from having sat in a moldering heap of refuse left behind in the hardware store. 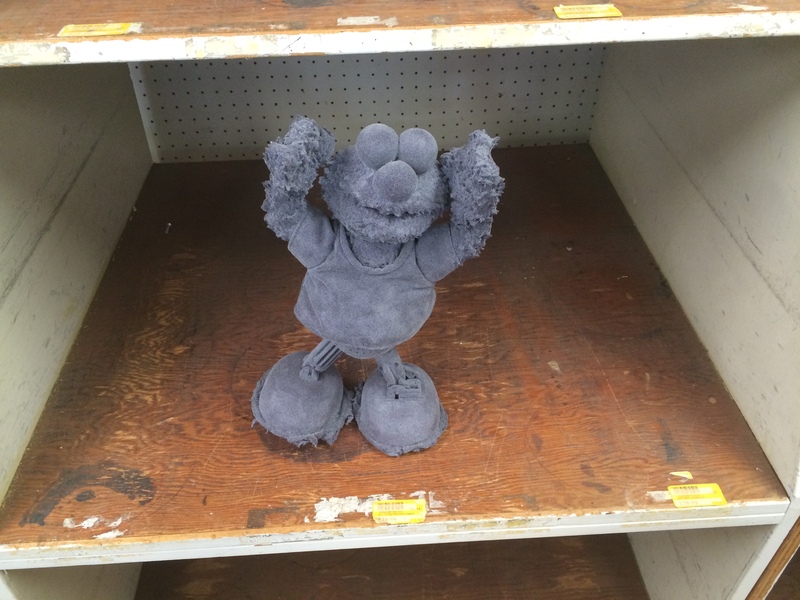 “Everything was covered in two inches of dust,” mentions the gallery attendant. Schwegler came in and cleaned out the space, mining some of its zombie objects for the show. The beach ball is a marvel because after years of utility and no-one-knows-how-long of zombiehood, it is still perfectly inflated, begging to be useful again. One pedestal over, the trash bin, dented and stained with paint, strikes me as elegant meta-commentary: the object that once held garbage is destined to be garbage itself. 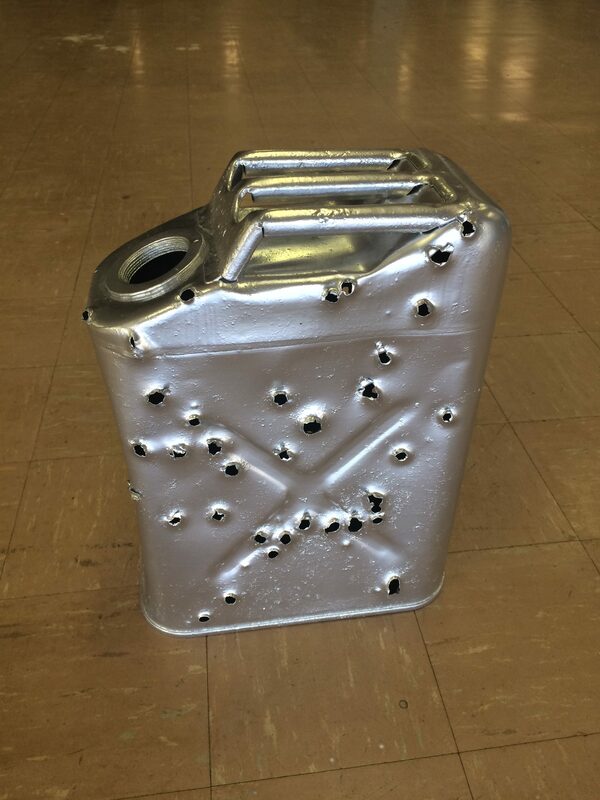 A vintage metal gas can on the floor, riddled with large-caliber bullet holes, served two purposes during its life. The first as a gas can. It’s second purpose, as a shooting target, made it impossible for it to return to its intended purpose, and now it will be cast aside, without thanks for either. There are pieces in the show that I still don’t understand, which is something I’m not supposed to say as an arts writer. I don’t know how a glass bunny, which Schwegler made during a residency at Bullseye, relates to the rest of the work, and I am only now, as I write this, developing a theory about why the artist chose to powder coat the chain link cage the same gray color as the original metal. And it is only a guess (I think it relates to the flocking and the dust that was left behind in the space, and the layers of time that obscure the utility of an object); you might have another interpretation. What speaks highly for the exhibition is the fact that I am still thinking about these ideas weeks later, still trying to figure them out. Like I said, this one takes time. The reception for this exhibition will be 1-4 pm Saturday, August 13, at the Hazen Hardware Building, 136 N Nehalem, Clatskanie, Oregon. Gallery hours are 12-5 pm Wednesdays-Saturdays.